The world is becoming a global village is the most common statement we keep hearing in our daily life to highlight the importance of movement of goods and services across the globe. It started with online knowledge services, outsourcing of services offline of all non-core activities and finally of even physical goods. China became the manufacturing hub for hard currencies and helped even other cheap labour Countries to have a role in manufactured goods. Disruptive technologies gave rise to new business models and helped forward looking companies to create the global procurement division. Here again the initial focus was on raw materials and slowly and steadily now it has come down to even promotional corporate gifts. Most of the MNCs have created the global procurement division and the role is very clear to find out the best rates at each operational location and to streamline the processes so as to source the various goods from the various geographies at the most economical manner. We have been working with various such procurement divisions of MNCs and are in a strong position to help them buy promotional merchandise at the most economical rates. Corporate gifts vary in nature because of the quality, quantity, logo branding, packaging and makes it difficult for the procurement division to source directly from the factories as rarely you buy the same item again and again. New business gift products keep getting introduced with the better utility and prices forcing even the respective country purchase managers to tie up with strong local sourcing players with sizable volumes and muscles to carry out their sourcing roles effectively. In the above circumstances the global procurement division has the larger challenge of doing multiple somersault at the same time as the various countries further adds to the existing complex situation of sourcing corporate gifts. 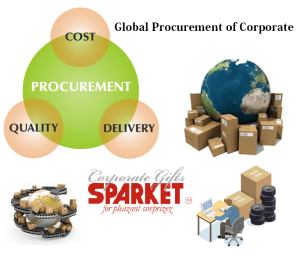 How Sparket is Helping the Global Procurement Division of Corporate Gifts? In the initial phase we were helping the global procurement division to check the Indian rates and decide on the various buying indents they use to receive from various countries to place the order on the lowest CIF quote for the approved quality. However, lately we are in the advanced discussion stage where the buyer is asking us to even source from the various nearby Countries and quote to make it win – win for all three of us. Here our suggestion to them was to start sourcing from India for the time being and gradually move to the next model of sourcing from multiple smaller manufacturing countries as the volume increase will make it worthwhile for all involved. To help them cut down the red tape and multiple quotations we even suggested to pay us the overriding commission on the invoice amount in the most possible transparent manner to help us, help them streamline their global sourcing of corporate gifts in the best possible manner. This way they will outsource their global procurement of merchandise items to us and we will use our resources to procure items for them in the cheapest possible manner to help them reduce their cost year after year by finding new and better factories. We have existing relationship with many corporate gift vendors from hard currencies who are buying goods from us to deliver within their respective countries or even in India or nearby countries due to overall cost effective prices. We maintain a very healthy relationship with all our gifting partners by ensuring that we remain invisible and sincerely behave as their back office here in India. ← Long Term Win-Win Partnership with All Partners!